It’s a grey day when we go to meet Jessica and Hugo Mulliez, however, the photographs of our encounter don’t seem to have been affected. As if the sun and luminosity were omnipresent for the occasion in this Parisian apartment which is more a house than a simple studio. Entirely redesigned by an architect’s practice, these former offices are now a generous space in the centre of the 9th arrondissement. An area that Jessica and Hugo Mulliez wouldn’t leave for all the tea in China. Its effervescence, its creativity, its mix of influences: it’s all there. A feeling of travel, without leaving Paris. Just what they needed. 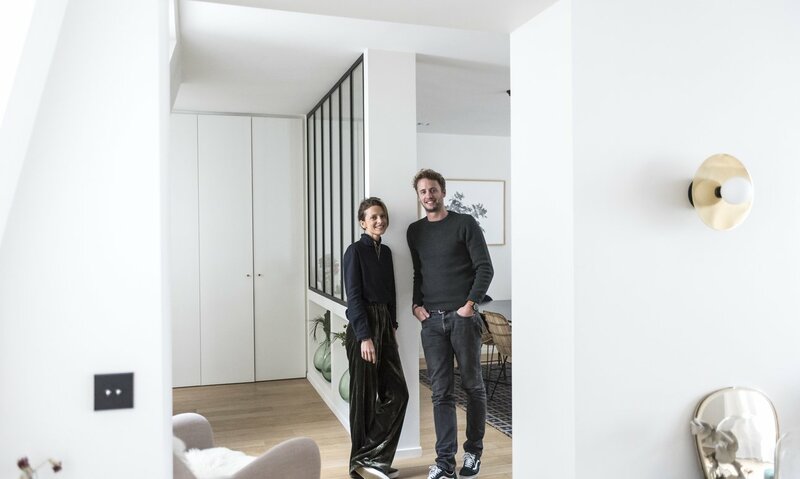 For these two entrepreneurs – he co-founded Artsper, a startup specialising in the online sale of contemporary artworks while she created her medallion brand, Poinçon 22 – the location is ideal. The apartment reflects their personalities. It’s alive. Surrounded by objects of every kind revealing a strong attraction to art (obviously!) 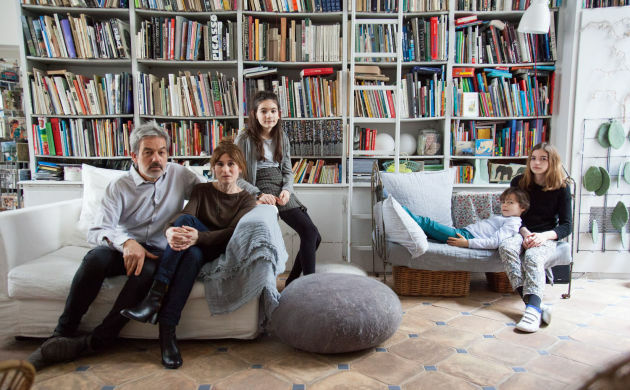 but also to design – including great attention paid to the choice of lighting – Jessica and Hugo Mulliez seem to be flourishing. We enjoyed spending the day in their company, a sign that their desire to make their guests feel as if they are “at home” has succeeded. Warmth, conviviality: The Socialite Family got a glimpse into the life of a young couple with a definite eye for detail. A multitude of signs that, together, felt to us like a real breath of fresh air. Large round cushion in velvet. Available in 7 colors: blue, green, white cream, grey, mustard, cappuccino and burgundy…. Tibby Velvet Chair La Redoute. Simple and uncluttered line that fits easily into any interior. Drawing by Jean Bernaux “material element” of the sixth continent series. Sold on Artsper. Green Velvet Croisette armchair from Honoré Déco. Jessica, Hugo, can you tell us about yourself? What is your story so far? We both originally come from Lille, where we grew up, and studied business together before coming to Paris in 2012. Me to create Artsper, and Jessica to join Van Cleef & Arpels before joining Boucheron in 2012, then finally to launch her own label, Poinçon 22. We both met in middle school, have been together since 2010, and got married two years ago. Could you tell us about Artsper and Poinçon 22, your two business ventures? Poinçon 22 is a Parisian label with a range of 18-carat gold medallions with precious stones that I launched last year. Medallions have been given a new concept to make them more contemporary and desirable. They have been an iconic piece of jewellery since Roman times, and they are the item of choice for a woman, or to mark a birth, christening, or wedding. I create the complete design before artisan jewellers who are selected for they skill put together the finished product out of 18-carat gold. Poinçon 22 medallions are customisable, allowing anyone to create their own piece of jewellery with its own story. They are laden with emotion and symbolism to mark major life events and are designed to be handed down through the generations. Artsper is a start-up that specialises in selling contemporary works of art online. I co-founded the company in 2013 with the aim of making art more accessible to everyone. We work with over 1,300 art galleries throughout Europe, and they sell their work over Artsper, allowing us to offer nearly 70,000 original works to our users, who can place an order with a few clicks. Our mission is to give everybody access to the art world by discovering the works of a wide variety of artists and allowing them to buy a piece of that artist’s creative output. The prices vary significantly depending on how well-known the artist is. 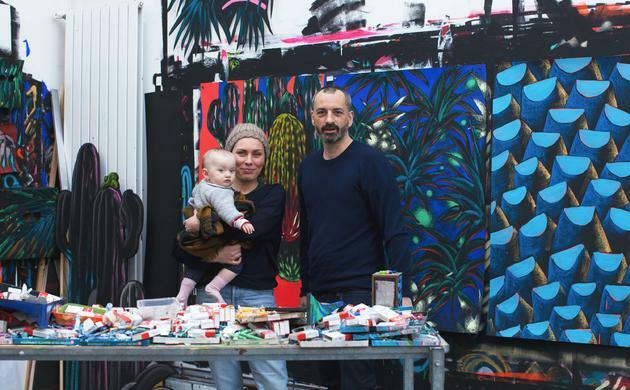 We offer works by very young artists as well as major figures in the contemporary art world. Do you often work from home? 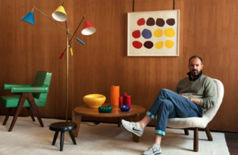 Have you furnished your apartment in a particular way as a result? I love my office, it’s a bright room where I find my world around jewelery and my inspirations. So I tend to like to spend time there. If I have to work from home I am often on our dining table where I spread my things very quickly. “Amour” CSAO plate hand painted. So, what’s the story behind the apartment? We moved in a year and a half ago. We already lived in the neighbourhood and wanted to stay here. It’s an old office space that was completely refurbished by an architectural studio. We were charmed by the apartment immediately due to the way it made us think of a little house: the beams in the living room, the open-plan kitchen and the central courtyard. It really has been designed to make the most of living spaces! It’s an apartment that reflects our way of life. Lots of light, souvenirs from our travels, lots of greenery and imagery of plants: how would you describe your decorative style? How do you need to feel when you’re at home? 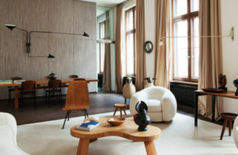 We like different styles of decoration, particularly Art Deco and modernism. 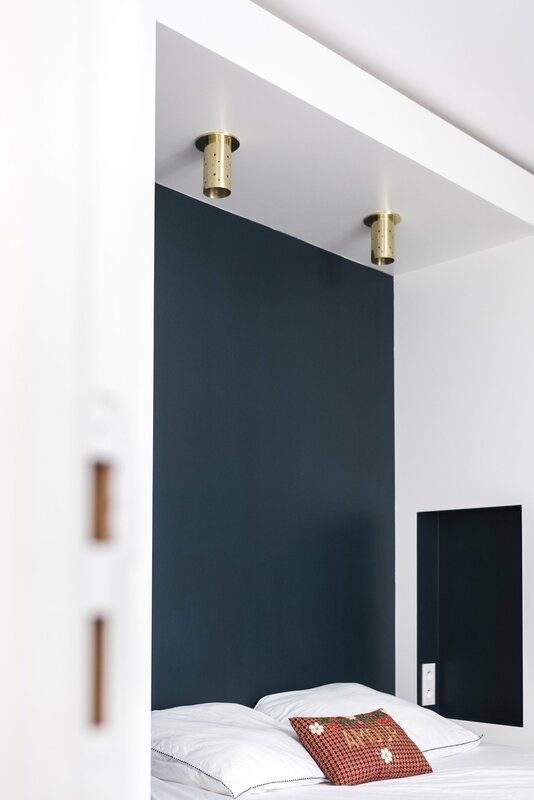 However, for our apartment, we chose a simpler, more modern style brightened up with a few splashes of colour. It’s important to want to settle in any room, to be able to cook anything while chatting with someone in the living room, and so on: a warm, friendly and relaxing place. 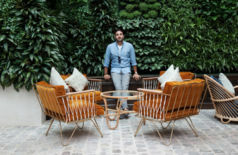 While natural themes are repeated throughout our interior, it’s probably down to our craving for fresh air and nature – something that doesn’t sit well with the Parisian life, unfortunately. How did you choose your furniture? Do you have a favourite era or a designer that you always choose? Every piece of furniture, picture frame or trinket has its own story: a trip, a gift, an event, or just something we fell in love with: we love blending modern style with designer pieces. For the living room, we wanted a warm space with a big sofa that would be comfortable enough to make you want to sleep there. For the more modern kitchen, we chose the lighting very carefully, because it’s one of the first things that you notice when you enter the apartment. Hugo, what advice would you give to readers who want to acquire a work of art? Above all, I think that you need to buy a work that you like and that resonates emotionally, especially when you don’t expect to work with a substantial budget. Many people think too much in terms of potential gains upon resale, and that’s a pity. Look for a work of art that means something to you above all else, then ask about the price afterwards. Potential investment gains should be the icing on the cake, but not the decisive factor – unless you truly are thinking like an investor, in which case I recommend that you obtain the services of an art adviser who fully understands market trends and who can point you in the right direction. Artsper is the best way to get an overview of what’s on offer in the contemporary art market. By playing with the search filters, you’ll very quickly work out what you like, and what inspires you. How did you choose the art that you have at home? We bought all our art on Artsper, obviously! The most difficult thing was not finding something that we liked, but reaching agreement on what to buy, because art triggers some very personal feelings. Antoine Rose and Julien Colombier are two artists that we both really like. We chose a piece by Antoine Rose for our living room because we never stop looking at it and discover a new detail every day. We also like more primitive creations, such as our palm from Herbarium or the butterflies from Hugo, each for their own particular occasion. Jessica, what’s your favourite material or colour at the moment? I’ve always loved velvet for the softness that it brings to an interior, and I also like natural materials like glass and wood. As for the colour – terracotta, without hesitation. I fell for this colour in Positano in Italy when I saw Le Sirenuse. Where do you go in Paris to get inspiration, to hunt for bargains, or just to buy beautiful things? Often I go searching outside Paris, in the antiques village and I love the flea market in Cap Ferret, where there are always some lovely surprises. But if I am bargain hunting here, I tend to take a walk around the site in Selency. What are your favourite restaurants, here or anywhere else? Cherche Midi for linguini alla vongole. Le Bien Élevé for delicious meat. HC30 Deep Nankin Blue paint by Ressources. White satin cotton flat sheet with openwork ladder border. Available in two sizes: 240 x 300 cm and 270 x 300 cm. Medaillons have been an iconic piece of jewellery since Roman times and they are the item of choice for a woman, or to mark a birth, christening, or wedding. The Art and Love of Beautiful Things. 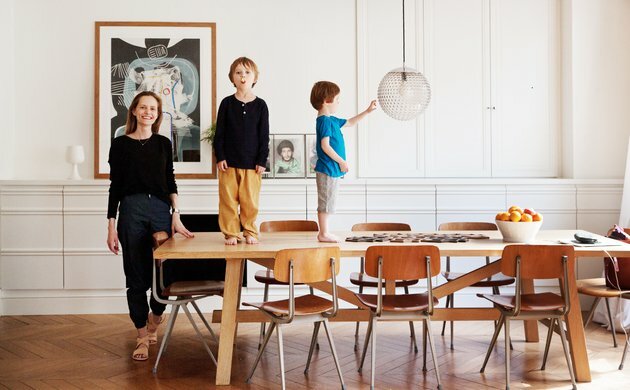 A Country Feel in a Parisian Family Apartment. Tres bel appart ! Harmonie des lignes et des couleurs ! Les lampes de la cuisine sont canons , d’où viennent elles ??? Merci pour vos mots ! Les suspensions de la cuisine sont le modèle Vadim, de la Maison Sarah Lavoine. Vous pouvez les retrouver juste ici.